Vernon Wright was a journeyman utility whose five senior matches for Carlton were spaced over three seasons from 1920 to 1922. Obviously a loyal clubman, he stayed on at Princes Park for another four years after his last senior game, and played in a forward pocket in Carlton’s inaugural Reserves Premiership team in 1926. Wright was born in Brunswick in 1900. In 1919 he became one of the first players to play in the new League Seconds for Carlton District (the forerunner of Carlton Reserves), while his father Richard became one of the Carlton Delegates to the VFL. Richard Wright had also been Treasurer of the Carlton Football Club during 1914 and 1915, and was a Life Member of the club. “Regretful reference was made at the meeting of the League on Friday to the death of Mr. Frank Hyett, one of the Carlton delegates, by Mr. G. Inskip, who occupied the chair. Mr. R. Wright*, who has been appointed delegate of the Old Blues, was cordially welcomed. Delegateship seems to run in the family, as Mr. Vernon Wright, son of Mr. R. Wright, represents the Carlton District at the Junior League**." In 1920 Vern Wright was offered a place in the Blues’ senior side for the round 15 match against Melbourne at the MCG. He was assigned to a half-back flank alongside his captain, Paddy O'Brien that afternoon, and both men had good games while Carlton hammered the Fuchsias by ten goals. In his second match, he started in the back pocket in another big win over Geelong, before Carlton rounded off the home and away rounds by thrashing Collingwood at Princes Park. By then, Wright could boast of three wins on the trot by an average margin of 59 points - just as his career came to an abrupt halt. He wasn’t selected in either of Carlton’s 1920 finals teams, and was cleared to Brunswick for the 1921 season. Remarkably, he returned to Princes Park in May, 1922 and in rounds two and three of that year, played in a ten point victory over Fitzroy and a 7-point loss to Collingwood at Victoria Park in the only loss of his senior career. That was to be Wright’s final appearance with Carlton firsts - but not his last in the Old Dark Navy Blue. 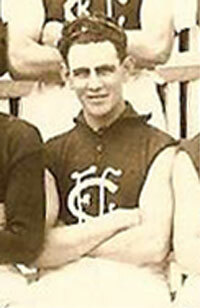 He was cleared back to Brunswick on May 3, 1923 but later returned to play with Carlton's Reserves. On Grand Final day in 1926, while the crowds in the stands built toward a mammoth 59,000 at the MCG, Carlton and Geelong Reserves met in the curtain-raiser for the Seconds Premiership. Running out for the Blues, and still proudly wearing the number 26 on his back, Vern Wright shared the roving duties with Ernie McAlpine, and helped his team to an emphatic 52-point win. Vern later became the Foundation President of Carlton's Past Players & Officials Association, and in 1977 he followed his father's footsteps by being awarded Life membership of the Carlton Football Club. He died on April 17, 1978, aged 77. -** 1919 was the first season of the League’s Reserve (or 2nd Grade) competition, which lasted for 80 years before being wound up at the end of 1999. Contributors to this page: Jarusa , molsey , Bombasheldon , PatsFitztrick , WillowBlue , tmd1 , true_blue24 , p(12)terg and admin . Page last modified on Tuesday 15 of January, 2013 09:35:49 AEDT by Jarusa. 1999 Prelim. SOS to the Rescue. 1981 2nd Semi - Team List & Selections (pg 1 of 2).